1. 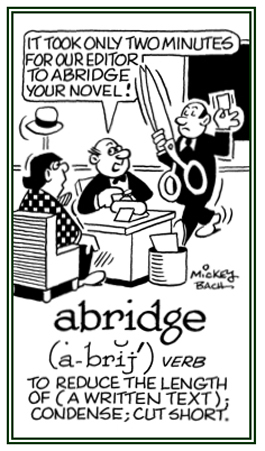 Shortened; to decrease, condense, digest: "The book was abridged to a more readable length." 2. Restricted, limited, curtailed, diminished, or someone who has been deprived of something: "No one should be allowed to abridge citizens of their legal rights." 3. A reference to a book, play, etc. that has been made shorter or condensed from the original but which contains the same basic story. Anyone who abridges, shortens, reduces the length, or who makes abridgments of a written text; a summarizer, synoptist, or a compiler. 1. A summary, a short code of instructions, etc. 2. A writ by which a person is summoned to answer an action, a complaint, etc. in a court of law. 3. A small curved diacritical mark, u curved or like a tiny smile, placed over a vowel to signify that the vowel has a short sound; with such words as: cat, pet, sit, hot, up, and cut. A reference to having a higher rank without an increase in pay. An official document granting certain privileges from a sovereign or government; specifically, in the army, a document conferring nominal rank on an officer, but giving no right to extra pay: "As a Captain in the army, Erick was given a temporary commission as a colonel without the related pay and allowances." To be promoted in rank or a position without a pay increase. 1. A brief statement, summary, epitome. 2. In the Roman Catholic Church, the book containing the "Divine Office" for each day, which those who are in orders are bound to recite. Having a short tail or short-tailed. An abnormal shortness of the neck.